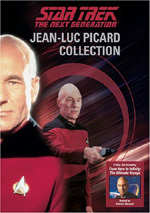 Available for the first time on DVD is a collection featuring the bizarre and strange of episodes of Star Trek! See your favorite characters behaving contrary to type in familiar but odd circumstances in Star Trek: Alternate Realities, a 5-disc fan-collective that includes 20 episodes selected from all five Star Trek television series plus exclusive special features. For the next in Paramount’s Star Trek “Fan Collective” compilation packages, we get the second one that spans all five series: Alternate Realities. Each disc in this five-platter set spotlights one of the different branches of the Trek tree. Like prior releases, fans voted to select most of the episodes, but they’re not alone. 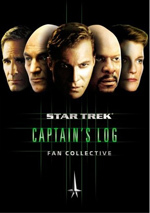 On each disc, we find one program chosen by the series’ captains themselves. Star Trek Fan Collective: Alternate Realities includes 20 episodes, with things pretty evenly spread among the five series. For these shows, I’ll offer the usual episode synopses and thoughts. I wrote most of the plot overviews myself, but if you see quotes involved, then the material came from tv.com – thanks to them for their good work. Mirror, Mirror (The Original Series). This episode offers a fun concept: the alternate universe. After they unsuccessfully attempt to convince the inhabitants of a peaceful planet to sell them some minerals, Kirk, McCoy, Scotty and Uhura are sent to an alternate existence through a teleporter mishap. Although they’re on the Enterprise, it ain’t their Enterprise. Here they belong to “the Empire”, a cruel and vicious union that sounds a lot like another Empire featured in some moderately popular films of the late Seventies and early Eighties. Crossover (Deep Space 9): When they return from a mission to the Gamma Quadrant, Bashir and Kira experience a weird fluctuation. After they emerge from the wormhole, they find themselves in an alternate reality with an alternate Kira in charge of the station and lots of other alternate factors at work. Terrans are lowest on the food chain here, so Bashir gets sent to ore mine. The two Kiras get to know each other as well and we discover some interesting details about this different world. Trek adores its alternate reality episodes, so we’ve seen this territory surveyed in the past. However, “Crossover” manages to give the subject a clever slant, especially in the way it connects to an episode of classic Trek. “Crossover” provides a slick and stimulating program. Through the Looking Glass (DS9): O’Brien takes Sisko prisoner at the beginning of the show. However, this doesn’t last long, as the Commander wrests control from the Chief after they transport to a parallel universe experienced in Season Two’s “Crossover”. Their Sisko’s dead, so they need a replacement to finish a mission. This plays on his emotions, as in this universe, his deceased wife Jennifer is still alive. He agrees to the assignment to make sure she doesn’t die again. ”Crossover” seemed clever and lively, but “Glass” lacks the same spirit. Part of that stems occurs because “Glass” goes to the well too soon; only one season later is too quickly to return to the same alternate universe. The moments between Sisko and Jennifer also lack the emotional heft they require. While I usually prefer action to sentiment, this should have been an exception, but the show instead opts for brawn over heart. Shattered Mirror (DS9): Sisko reconnects to the alternate universe occasionally seen in prior episodes. Jake becomes shocked when his mom Jennifer (Felecia M. Bell) pops up in his dad’s quarters. Understandably, this connection with a reasonable facsimile of his dead mother messes with Jake’s mind. He and Jennifer apparently high tail it back to her universe, and Sisko heads out with accomplices to find them. It turns out everything was a ruse to lure Sisko over to help the rebellion. The alternate universe episodes are usually interesting, and “Mirror” has its moments. However, it doesn’t offer much to develop the prior stories, and it lacks much emotional impact. One might expect Jake’s apparent reunion with his long-lost mother to provoke more feelings than just banal cheerfulness. The Alternative Factor (TOS): Judging by the fact that it was shot twentieth but not shown until very late in the season, I'd take that as a sign that the show's producers knew that this wasn't much of an episode. It's a completely uninspired mess, really, from the bland title all the way through the muddled story and forced philosophizing of its conclusion, this one's quite forgettable. The plot really is what kills this episode, as it's far too complicated. That doesn't mean it's deep or intellectual and my tiny brain couldn't handle it; it simply means that the story doesn't get told effectively and the result is a botched mess. There's some potential to the tale of alternative universes, but the execution kills it by making the entire affair thoroughly confusing. I suppose this one might work better upon subsequent viewings, but probably not. Parallels (The Next Generation): Worf encounters some funky memory problems. He returns from a Klingon battle competition that he won. The crew throws a surprise birthday party for him, and Worf starts to experience some dizziness. After this, he finds that his memories seem to deceive. He forgets orders from superiors and finds that he recalls things that others don’t get. This occurs as the ship enters the Argus Array, which has ceased to relay data for the third time this year. The Enemy Within (TOS): All of the spice we need comes from Shatner. He hams up a storm as yet another odd alien force splits him into two separate beings; one good and one evil. This episode is surprisingly philosophical and actually presages some parts of Star Trek V as Kirk and company consider what parts of a personality are truly essential. Turnabout Intruder (TOS): This show formally concluded the series' three-year run with more of a whimper than a bang. Though not a bad episode, "Intruder" was far from the best the show had to offer. At the start of the show, Kirk falls for a trap set by Dr. Coleman and the mentally ill Dr. Lester. Kirk had a fling with Lester back at the Starfleet Academy, but she got booted due to her instability. She still feels bitter about that experience and resents men because she can't enter the same ranks of Starfleet advanced personnel. Of course, she especially dislikes Kirk, since he represents the best of the best within the world she can't enter. Anyway, as part of this trap, Kirk and Lester swap bodies. She takes over his form and plans to kill her old body with Kirk in it. This goes awry, so she has to take Kirk back on board the Enterprise. While there, the fake captain performs a slew of inappropriate and atypical actions, which stirs suspicion from Spock. Trapped in the female body, Kirk has to find a way to convince others of what's happened and eventually restore his mind to his manly form. Though clearly a silly episode, "Intruder" had some potential due to the intriguing theme. However, some poor acting and surprisingly non-progressive attitudes made it less than terrific. In regard to the former, Smith actually did a pretty nice job as Kirk in Lester's body. She brought positive authority to the role and seemed convincing. Honestly, in some ways she appeared superior to Shatner, as she lacked his emotive tendencies. On the other hand, Shatner's turn as Lester in Kirk's body could not have been more absurd. He strongly played up the stereotypically female aspects of the role and made it a tremendously camp experience. Shatner's wispy and eccentric performance made it difficult to believe that so few suspected anything was up with the captain. As I mentioned, the show treated women in a particularly stereotypical manner that I didn't expect given the series' generally forward-looking attitudes. Granted, Trek did better in that regard when it came to different races; the program never could figure out what it thought of women. Still, the bitter and psychotic Dr. Lester seemed like a poor representation of the female attitude, and this element hurt the show. Frame of Mind (TNG): Riker takes the lead role in a play of that name. He also receives an assignment to venture to Tilonus IV, a planet experiencing a state of anarchy. A Federation research team got stuck there when the government collapsed, and Riker will go undercover on his own to retrieve them. However, on the way he starts to suffer from hallucinations and seems to turn into the character from “Frame of Mind”, which leads him to question his own sanity. Trek often delves into this kind of reality vs. fantasy show, but “Frame” seems better than most. It really gets pretty trippy at times, as all the various layers of truth and fiction intertwine. Overall, “Frame” appears involving and it provides a cool mystery. Shattered (Voyager): "After Voyager passes near a spatial rift, Chakotay is injured in Engineering, leaving his body in a state of temporal flux. After receiving treatment in sickbay, he inadvertently gains the ability to pass through rifts in time that are scattered throughout the ship, enabling him to walk into different stages of Voyager's history over the past seven years." Yesterday’s Enterprise (TNG): We find the Enterprise present at some sort of mysterious time displacement. This moderately alters reality. This Starfleet is at war, and Tasha Yar rematerializes from the dead. Uniforms and ship architecture seem mildly different as well, though the changes aren’t extreme. Guinan senses that things are strangely wrong, but Picard can’t grasp the concept. Of greater immediate concern, this bizarro Enterprise encounters the titular older vessel, the Enterprise-C. Picard deals with its chief, Captain Garrett and tries to sort out the facts of the matter. He discovers that they could send back the Enterprise-C to their original time, but this would ensure the destruction of the ship and the death of its crew. The Inner Light (TNG): A mysterious probe approaches the Enterprise. It sends a beam inside the ship that apparently only affects Picard. He passes out, and when he awakes, he finds himself on a strange planet in the hands of a woman who refers to him as “Kamin”. Her name’s Eline, and she’s supposedly his wife. Picard/Kamin roams that landscape as he tries to discover where he resides and how he can get back to the Enterprise, even as the years seemingly pass. Meanwhile back on the ranch, we see that Picard remains unconscious, and the crew tries to figure out how to disconnect him from the probe and bring him back to reality. When we see episodes that deal with Picard and an alternate reality, they usually find him in a domestic situation that forces him to examine the life he could have lived. “Light” offers a watchable but somewhat bland example of that genre. I do enjoy this kind of “alternate reality” material, and this show seems different from the others as it displays many years of Picard’s second life. Unfortunately, the probe’s purpose becomes obvious too early, which renders the show a little toothless. Overall, “Light” appears decent but unspectacular. The Visitor (DS9). The program uses an unusual structure, as we meet an aged Jake Sisko. We learn that he turned into a success writer who penned only two works. We also find out that his father apparently died when he was 18. The show then displays when happened during a scientific mission on which Jake accompanied Ben. Things go wrong, and we see Ben killed right before our eyes. We then watch as Jake tries to deal with the death of his dad. However, it turns out Ben didn’t die at all; instead, he went into some sort of temporal displacement, and he eventually reappears on DS9 after more than a year. However, he soon vanishes again, and the show traces Jake’s life and his dad’s periodic resurfacing. An entertaining fantasy, “Visitor” loses some points because it never rises above that level. Since it takes place in the future, it deals with a reality that doesn’t exist in the show and – due to some events that occur – never will. “The Visitor” offers some moving moments and seems interesting overall, but it feels like something of a disappointment after the drama of “Warrior”. We’ve seen many episodes that deal with alternate or possible futures. However, “After” seems different in that some parts of it just might stick. For one, Kes finally has a decent haircut, and while she returns to the correct place and time, she maintains memories, which means the possibility of a lasting impact to her experiences. The show doesn’t make a lot of sense, but it’s fun to watch. 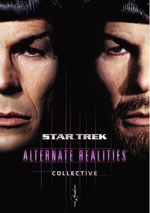 Star Trek: Alternate Realities Collective mostly appears in an aspect ratio of 1.33:1 on these single-sided, double-layered DVDs; due to those dimensions, the image has not been enhanced for 16X9 televisions. The only exceptions come from the three Enterprise episodes, as they use an anamorphically-enhanced 1.78:1 ratio. Since these episodes spanned five series, they offered distinctly varying visuals. I’ll look at each one of those separately. The “Original Series” episodes presented here all came from the new remastered sources, so they looked better than the prior releases. Some of the upgrades related to sharpness. The remastered episodes still suffered from a little softness in their wider shots, but those instances remained modest. The programs usually boasted crisp, accurate visuals. Jagged edges and moiré effects were minor at worst, and no edge enhancement marred the presentation. Colors always looked fine in the old transfers, and the hues continued to impress here. The show always used a bright, vivid palette, and the colors came across as quite winning. Blacks were full and rich, and low-light shots showed good clarity and delineation. I thought we found a little too much softness and a few too many print defects to bump these episodes above a “B+” level, but the shows looked excellent given their age. Not a show with a broad palette, Voyager did offer pretty natural tones. As with the prior volumes, the colors tended to appear reasonably dynamic and vivid. Colored lighting succeeded as well, for those shots came across as clean and concise. As with most Trek shows, blacks were a little muddy but not badly so, and shadows appeared slightly dense at times. I felt those concerns stayed modest, and the programs looked more than good enough to merit a “B+”. All things considered, I combined these grades to give the whole package a “B+”. “Crossover”: director David Livingston. He discusses camerawork and lighting, visual effects, changes to the alternate DS9, cast and performances, and a few story topics. Though dry at times, Livingston manages to provide a fair amount of good info. He gets better as the track progresses, so this eventually turns into a useful piece. “Parallels”: producer/writer Brannon Braga. This track looks at aspects of Braga’s Trek career, the genesis of the story and elements of the script, various character/plot challenges, influences, and a few production elements. Braga provides a consistently engaging chat. He digs into some nice episode specifics and also gives a good overview of his Trek experiences. Heck, he even makes fun of the series’ technobabble in this fun and informative discussion. “The Enemy Within”: Enterprise writers/producers Garfield and Judith Reeves-Stevens. Here we learn about cast and crew, production details, series trivia and some goofs. Since neither participant worked on “The Original Series”, this commentary lacks the intimacy of the first two, but it still includes good information. Garfield and Judith seem to know Trek pretty well, and they offer some useful details in this enjoyable track. “Yesterday’s Enterprise”: director David Carson. The director chats about staging and scenes, the script and complications related to Whoopi Goldberg’s availability, sets, lighting and other changes made for the “alternate reality” of the episode, and a few other production issues. On the negative side, Carson goes silent a little too often. However, he still manages to provide quite a lot of good info about the episode in this solid piece. “Twilight”: producer/writer Mike Sussman and Startrek.com editor/producer Tim Gaskill. The final track gets into script and story, cuts and changes, influences and connections to other Trek, and general production notes. The “Twilight” commentary never quite excels, but it works well. It gives us more than enough useful material to merit a listen. The package also includes a mix of featurettes. These cover Mirror Universe (two parts, 19:08 total), Parallel Dimensions (7:06), Twisted Realities (12:52), and Alternate Lives (two parts, 25:32 total). Across these we get notes from Garfield and Judith Reeves-Stevens, Livingston, Sussman, Gaskill, Braga, Carson, co-executive producer/writer Manny Coto, co-producer/writer Bryan Fuller, writers Terry J. Erdman and Ronald D. Moore, producer Robert Hewitt Wolfe, and actors Nichelle Nichols, George Takei, Nana Visitor, Jonathan Frakes, Patrick Stewart, Garrett Wang and Tony Todd. The featurettes look at characteristics of the episodes that cover the themes detailed in this set. We also get many specifics for the different programs. These clips manage to offer good details about the various episodes, and they entertain as well. They flesh out the package in a satisfying manner. DVD One comes with some Previews. It presents an ad for all the various Trek DVD sets as well as the CSI series. We get a few glimpses of the wilder side of Star Trek via the “Alternate Realities Collective”. This packs a slew of the various series’ weirder, more “out there” episodes into one fun package. Picture and audio are consistent with prior releases; they come with ups and downs but are always watchable at worst and very good at best. We also find some interesting new extras. I wouldn’t recommend this to anyone who already owns the various complete season sets for these series, though I expect die-hard fans will be tempted to get it so they can check out the exclusive supplements. If you’re in the market for a general Trek collection, Alternate Realities works well.